Pinterest is one of the hottest new social media networks for small businesses and nonprofits. This highly visual platform has 150 million active users that conduct 2 billion searches every month. Pinterest users also buy more of the items they encounter in pins than items on Facebook, and spend 70 percent more money when they arrive at your website from Pinterest versus non-social referrals. But how can you successfully use this channel for your small business or nonprofit without looking dumb? Whether you’ve been too busy to figure out what Pinterest is all about or have fully embraced the social network, there are things you don’t want to do on Pinterest as you get started or more involved. 1. Not including your business information. The first step in getting started on the right foot on Pinterest is to create a profile that is full of details and represents your business. Upload a clear, easy to recognize logo for your profile picture and use your business name as your profile name. 2. Using a personal Pinterest profile instead of a business page. If you jumped on Pinterest in the beginning, you may still have a personal account. But as a business, you want to make sure that you set up a Pinterest Business Page. Without a business page, you’re missing out on valuable analytics! Make the switch to a business page today. 3. Failing to complete your profile. When you have a business account, you can select your “business type,” add your location, verify your website, and create a short “About You” section for your profile. Completing your entire profile is important for SEO purposes and helps you look more professional. 4. Not enabling notifications. In your Pinterest profile, you can turn on notifications for when someone engages with or comments on your pins. Enabling these notifications means you’ll never miss responding to a Pinterest comment or getting a feel for how popular your pins are. 5. Not following other businesses. The nature of Pinterest is based on collaboration. Find other local businesses in your area to engage with and stay updated on what your customers are pinning alongside items from your business. Also, look to other businesses similar to yours on Pinterest for inspiration. 6. Mixing your personal interest boards with business-related boards. There are actually a few instances where I’ve seen this done successfully, but overall this tactic doesn’t work. Are your customers actually interested in the recipes you’re considering trying or the table settings you want at your fantasy wedding? Probably not. Keep your business account for your business and your personal account for your personal interests. 7. Pinning images that aren’t Pinterest-worthy. Avoid pinning content that is too big, too small, too blurry or simply low quality. NOTE: Pins display in the feed at 192 x scaled height. Clicked pins display as 600 x scaled height. 10. Using inappropriate pins or repins. Don’t forget that your Pinterest Page is an extension of your brand. Stick to images that you’d feel comfortable sharing with anyone. 11. Going on day-long pinning sprees. Posting too many pins at one time can overwhelm your fans. Try not to pin more than five images within five minutes. If you want to dedicate a specific time in the day for expanding your Pinterest channel, try to put at least five to ten minutes between batches of pins. 12. Neglecting to choose a category for each of your boards. For each new board you create, you should choose a “Category” from the drop-down list. Selecting an appropriate category for your boards will make your content searchable. 13. Not adding a pin description or link source to pins. You can write up to 500 characters within a pin description so don’t skimp on the information you add! Use keywords related to your business, words or phrases people would search for, and relative hashtags to maximize your description’s context. When appropriate, link back to your website, other social networks, and your blog to drive traffic to your business. Insider tip: Pinterest is a powerful SEO tool! 15. Using hashtags. Pinterest will search for keywords and related terms anytime someone does a search, so hashtags are unnecessary in your pin descriptions. Pinterest actually doesn’t recommend using them at all. 16. All of your content is the same. Include various types of content throughout your boards such as repins, content from your own website, content curated from other websites or uploaded content. Don’t forget, you can also pin videos! 17. Not finding a balance. Pinning too many images from your website or blog or only pinning images from your website or blog is not ideal. Vary the content you post to keep it fresh and engaging. See mistake #16. 18. Not telling anyone your business is on Pinterest. Use the networks you already have (Facebook, Twitter, word-of-mouth, etc.) to spread the word. You can use Constant Contact’s email templates to let subscribers know you’re on Pinterest. Adding a Pinterest logo to your website or blog will also help grow your following and act as a reminder to people who visit your website to pin your content. 19. Dumping all of your content into one board. Use numerous boards to keep your content organized and easy to navigate. Smaller, more specific boards allow your fans to quickly pinpoint content that interests them, spurring engagement. 20. Ignoring Pinterest Analytics. As a small business owner or nonprofit, your time is limited. Don’t waste it! If you’re not reviewing the analytics Pinterest provides, how will you know if your efforts are having an effect on your business? Knowledge is power. 21. You pin anything. It’s easy to get lost in a sea of stunning images where you might find yourself repining anything that catches your eye. Don’t do it. As a brand, you’re trying to relay a message that portrays what your business is all about. Plan out your boards and outline what message or information you want your fans to walk away with before you start pinning. 22. Forgetting traditional social media best practices. Commenting isn’t the most popular form of engagement on Pinterest, but it is still important to monitor what your fans are saying and doing. Look for opportunities to respond and engage with potential customers too. Also, similar to other social networks, always remember to stick to a consistent content frequency that works for you. 23. Neglecting Pinterest’s unique features. You can add collaborators to any Pinterest board. This function allows others to contribute to your boards as “guest pinners.” You can also create secret boards to develop content before publically showing it off. 24. Overlooking your website’s content. Is it pinnable? Make sure your customers can pin from your website or blog. Test it out before you encourage customers to pin your images and if you don’t have great visuals on your site, get some! 25. Thinking that B2Bs don’t belong on Pinterest. As a B2B on Pinterest, there’s actually a lot you can do to humanize your brand and tell your story through visuals. Pinterest allows you to showcase the people that make your business a success, industry statistics or news, your brand’s content or useful information, and tips your customers can benefit from. You don’t need to be a retail brand to be successful on Pinterest either. Just take a look at the Constant Contact page. We’re an email marketing company and we’re close to having 70,000 followers! Thought pinning was as simple as picking up a corkboard and tacks from your local craft store? 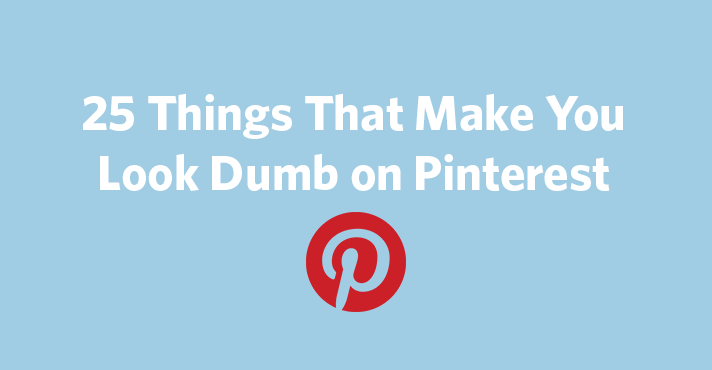 Don’t worry, by being aware of what makes you look dumb on Pinterest, you’ll find success! For more help with your social media marketing, sign up to receive our Hints & Tips newsletter.